The little fish tank I got a month ago cracked on Sunday. Our poor fish are now living in...our coffee pot! The rental came with a pot, since it was unused we put the pot to work. It makes me laugh everytime I glimpse at the pot. 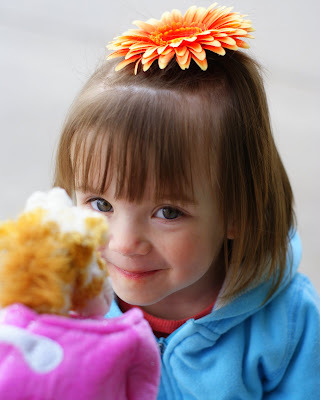 Amelia had her two year old appt today. She weighs 22.5 pounds and is about 31.75 inches tall, both range in the 20th percentile. At least she is consistent. She let the Dr hear her heart, look in her ears, and feel her tummy with out a squeak. Miekka gave us a book about Caillou going to the DR, I really think the book helped her understand the DR was just looking. When the DR left the room she said "See ya later, See ya soon, and Castle." Castle stands for "have fun stormin' the castle!" which Justin is trying to get her to say when he leaves in the morning and at lunch. After Amelia's checkup it was my turn. Amelia was glad I had to get on the table. I got some more allergy meds to help reduce all the reactions I've had lately. The DR went over my ultrasound from Monday. This time he said the Placenta Previa should move enough to not be a problem in about a month. 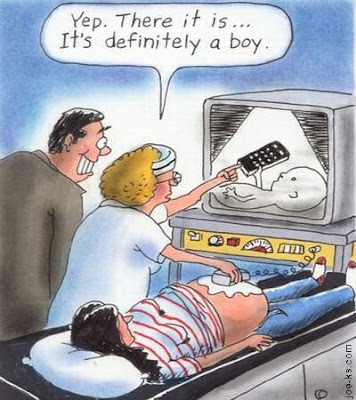 He wants to do ANOTHER ultrasound, this time to check on the baby. Apparently, the left lateral ventricle of the baby's brain is abnormally large, which could indicate congenital hydrocephalus. The abnormality could be just that and clear itself up in the next couple weeks of development. My first thought was, maybe the kid has Justin's HUGE head. LOL. We will see. Hopefully we reach our out of pocket max soon because the ultrasounds are really expensive (like $457). I don't like Cabela's health insurance! Yesterday evening our little town hosted a Girl's Night Out. Several local businesses participated in the event...including me! I packed up all the hats and shirts I made to sell for profit. Justin had to work late so Amelia came with me and watched Thomas the Train for the first 20 minutes. It smelled really good inside since there was a cooking table right one side and Salt City Candles on the other side. Yum. The event started at 5 pm and went until 9 pm. I was a little disappointed that only three hats and two shirts sold. Guess I will have to open an Etsy Shop now to sell the rest of what I have. It was a fun evening!! Fisher Price play kitchen, train puzzle, play food, dolly, mixer, tin pans, skirt/shirt/monkey shoes, cash register, color book, crayons, and fruit book. All day we told her little stories about her first day here on Earth. When she was first placed on me Amelia raised her head, saluted, and then went limp. That moment of clarity is still very precious to me! She's been a hard baby as far as sleeping is concerned, but we are working through it. She talks non-stop, much to our amusement. After her little party I took a nap at 6 pm! Then we went to the ice cream store (DQ) for a birthday hamburger. 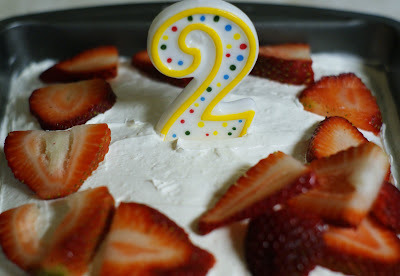 We officially have a two year old! 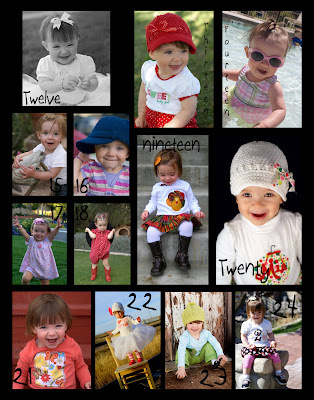 As I made a collage of the past year it seems unreal how much our little girl has grown. She started off the year barely able to crawl. Now she is running, talking, and playing. Her dimple is still strong and her smile is broad. All day Amelia's told us she is two and wants a birthday cake. She helped me pour the mix, add the ingredients, and pour the batter into a cupcake tin. She wanted two cuppy cakes like she has on her shirt. Grandma Debbie called and sang her "Happy Birthday" she looked everywhere for her birthday and couldn't find it! How cute is that? We love getting phone calls for Amelia. We put together her new little kitchen this morning. She is still playing hard three hours later. Love it!! 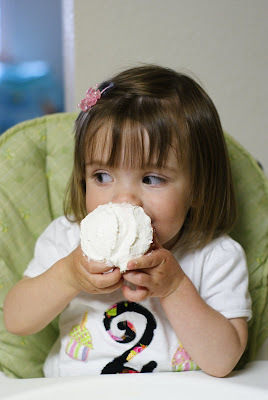 Later on Ella is coming over for cuppy cakes and to help her open a couple more gifts. LOL!! I was just brushing my teeth when I noticed my shirt was not doing such a great job. We had a cooler day today so a long-sleeved shirt was necessary. Hum...not working so well. I have two problems and neither solution seems sensible. One, my winter maternity shirts are stuffed in some long-lost, mis-labeled box in one of two storage units. Two, I am too cheap to buy more shirts only to wear it for a couple of days or weeks. Guess this sight may become common!! I can't believe how HUGE my belly is...at only 5 months. This was how I looked when Amelia was born. Already breathing is a chore and my insides are squished like I was 9 months along. Our little baby is a mover and shaker. It did not like my seatbelt while driving 8-9 hours. Whenever I stop moving it takes up dancing the tango. Most nights I can hardly sleep because of my baby's midnight parties. I tried to walk while in Utah to get some exercise, my belly would start to contract and cramp. Bummer. I really hope this does not signal the end of my gym visits. I enjoy working out. My next ultrasound is on Monday. I am pretty sure the placenta previa is not an issue...but we will see. Amelia and I have a DR appt on Wednesday. Me to go over the ultrasound and get the nasty gestational diabetes test and Amelia for her two year old well child. She will need shots which makes me nervous because now she can talk...or rather scream at me. I hate shots!!! More updates next week on this new little one; or shall I say twice as big as Amelia at birth at 5 months along?! Thursday: Both Amelia and I started off the day really tired. Sleeping in the same bed with kangaroo girl is not fun. We went to NPS for some food shopping since a soldier on leave, an all natural eater, a no gluten eater, and a rabbit make for sparse food. Jeff bought about 5 pounds of hot dogs, bread, and sausage to live off of...plus milk. My usual favorite good deals haunt did not have many good deals this time. I did find cereal for $.25 per box. After a nap we went to see Justin's cousin, Nancy. She recently had a baby boy, Kyle, who was diagnosed with SMA. I was very happy she allowed me to photograph her son and girls. We made due with a sheet, blanket, and pillows! All in all the pictures turned out super cute. It was nice to visit with Aunt Nancy and Uncle Bryan. I made sloppy joes for dinner then went over to James and Miekka's to play. The kids ate Popsicles and played. Amelia loved going up and down Seth's bunk bed ladder. She ended up melting towards the end and showed them a small tantrum!! Miekka let me borrow one of their Thomas the Train inflatable beds. 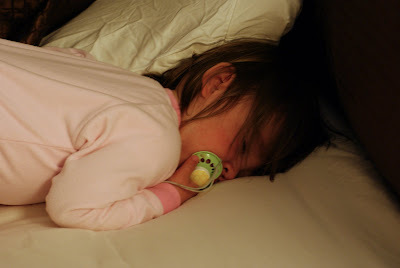 Amelia slept and napped in the bed with absolutely no problems. Thank heavens!!! Friday: I dropped Amelia off at Catherine Taylor's to play with Kate while I went to a huge consignment sale. 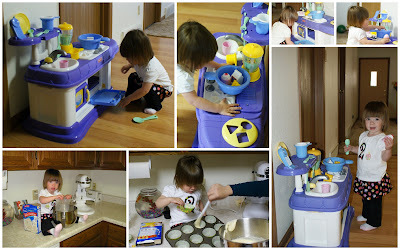 My mission was to find a play kitchen for Amelia's birthday. No luck! I did score some cute summer clothes (mostly shorts and skirts) for her. Miekka came with and found some shoes and outfits for Lia. I stopped at Kohl's to get Justin some dress shirts for work. Luckily, the store was selling their shirts for a really good deal. Catherine and I chatted for an hour. It was heaven!! We met Miekka at the Hobby Lobby after naps. I restocked my silk flowers, cotton yarn, and brads. For dinner we ate sushi to celebrate Miekka's birthday! This was Jeff's first taste of sushi, I think he enjoyed it. Miekka showed me the progress on their laundry/craft room. It looks awesome. We ate ice cream for dessert in Miekka's honor. Happy Birthday! Saturday: Jeff picked up Dad at 10:30. I went to JoAnn's looking for brown flowers...no luck. Shopping drastically reduced now that Dad arrived. We spent the first hour or so telling stories and talking. Amelia talked non-stop to dad about everything she could think of. It was cute to hear her saying "dampa Dane." Dad toured the house and made plans to built an addition for the house. James and Miekka hosted a BBQ for dinner, making fajitas on the grill. As usual the food was scrum-dittly-umptious. 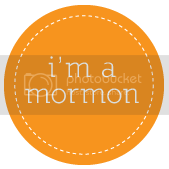 Sunday: I attended my old ward for sacrament meeting. There are a lot of pregnant ladies now...me included! Already I only knew about half the folks at church. We zoomed back to home base and picked up Jeff then drove to Wellsville. James and Jana also drove up with passengers. Grandma and Grandpa Baerwaldt were glad to have visitors! All the little people entertained us by jumping on the little tramp and doing what kids do best. Lia is a smiley little gal and really fun to hold. She will give you a huge gummy grin! Grandma made a yummy roast beef dinner. I made a fruit pizza for dessert. 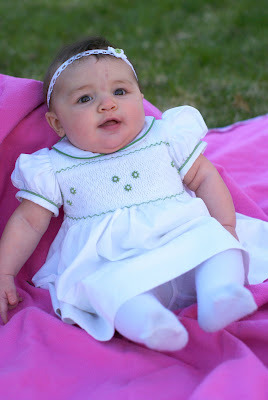 Amelia managed to spill grape juice all over her white Easter dress. We stayed a little while longer while her outfit went through the laundry. From there we drove down to Mt Green to visit with Uncle Matt and Aunt Laura. They were celebrating Melia's birthday so all their kids were there. Aunt Sally showed up with her husband and kids too! Mia loved running up and down the stone stairs in their backyard. Melia's little boy, Michael, was enthralled with Amelia...he exclaimed that she was a girl because she had a huge flower in her hair. Matt served angel food cake with strawberries to everyone. Yum, yum. We had fun visiting and catching up. John and Courtenay were home from Oregon when we arrived back. John is certainly the life of a party. Conversation was fun and entertaining. 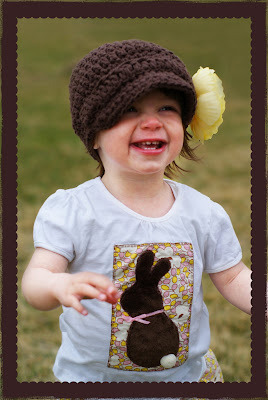 Monday: I went to Gardner Village to get some birthday pictures of Amelia. I really wanted to get her a pettiskirt but the shop was closed (huge bummer). I was really proud of myself for not spending any money at Pine Needles on uber-cute fabric. The highlight was riding a pony named Sparky. Amelia said, giddy-up and yippee, during her ride. She was a little worried with the pony blew some air. She wants to be a cowboy now. I think we are both allergic to horses since our noses started running and we started to sneeze up a storm. Plus the pollen count in SLC was super high. We've been miserable since Monday. My allergic reaction decided to turn into a full-blown sinus infection. Yucky. BTW: Tylenol does not work very well. 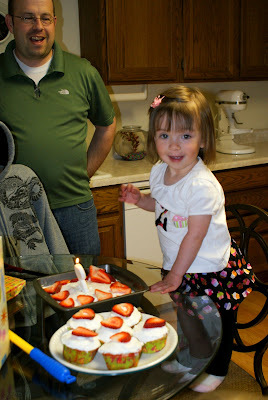 I planned BBQ for that night to celebrate Miekka, James, and Amelia's birthdays. Dad came home that afternoon with two new handguns. He got a Sig Mosquito and a Springfield .45. While I made potato salad he cut both fingers trying to get the slide off the guns!! It was funny to watch! Jeff grilled chicken, John made salsa, and I made salad. Miekka whipped out socks off by making a chocolate-mint fondant cake. It should be dubbed, Devil's Mint Cake. I've had a craving for it and she outdid herself. After dinner John showed us a slide show his company made from their time in Afghanistan. He tells fun stories. Being a Mom means I could not listen as intently all the time...the kids come first. The adults were to involved to break away from John's stories that we ended up eating cake and ice cream without them. Amelia unwrapped gifts from Miekka and Courtenay. She loves the monkey shoes Miekka gave her. Courtenay's gift of metal pans will make more sense once she gets her play kitchen on Saturday. 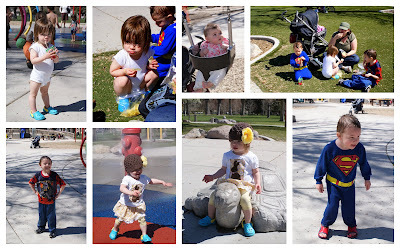 Tuesday: We met Miekka and kids at Liberty Park for a hour. Mia and I actually stayed about two hours playing in the sun, sand, and water. The little water area started spraying water around 11 am. Seth and Jacob were drenched after a couple minutes!! Mia stayed relatively dry but had fun playing outside the water blast zone. The weather was really warm and sunny, hooray! That afternoon we visited Aunt Charity, Libby, Mason, and Reagan for an hour or so. Amelia loves to pet their hamster. She was in heaven once they broke out sidewalk chalk. I barely made it home in time to pick up Dad and Jana for a session at the temple. James and Miekka were waiting for us (which usually never happens). We went through an endowment session. That night dad and John started discussing plans to renovate and reorganize the house. We talked until about 11:30. Wednesday: Jeff left at 7:20 am. His truck was packed and crated for the long drive back to Texas. I completed a last load of laundry (can I tell you how wonderful it was to have a washer and dryer available? ), packed and were on the road by 9:45 am. I was not ready to go back to Nebraska...it does not feel like home yet. Mia asked to go "ome" about 10 times a day to meet Daddy at the park. 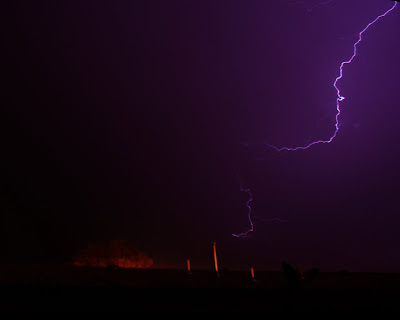 The drive back was excruciating for me. Mia was perfect she watched her movies, played with her blanket and mimi, and colored for 9 hours. We stopped three times, in Rock Springs for lunch, a rest stop, and for gas/restroom. I am really surprised that we made it back since my head hurt so bad I can barely remember the drive. Thankfully, I found a tape player (Walkman) to listen to a book on tape. My local library mainly carries books on tape. My car has a CD player. Bummer. Mia gave Justin a 5 minute hug, that totally made up for a week of vacation. Justin had the house cleaner than I've ever kept it! Thanks hun! He shooed me to bed by 8:30 and took care of Mia, bathing her and putting her down for bed. He even got up to comfort her at 4 am. I feel a smidge better today. I called Dad to tell him we arrived home. He said him and John ripped down a couple walls and started renovating the rooms like we talked about. There is never a dull moment with Dad around! I think the new renovations will make more sense and give them an office, a new pantry, and bigger dining room. I can't wait to get back in 6-7 weeks. My mom is coming back for the summer, Mason is getting baptized, and I have a photography class the first week of June. PS: the tree outside my window is green leaves on it now...super happy hooray. P.P.S. 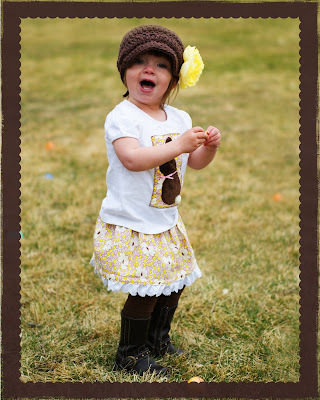 : Amelia's first color she said by herself was chocolate. 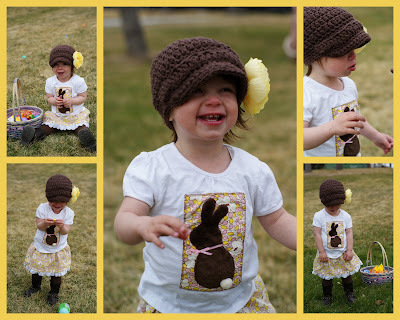 We wore a brown shirts yesterday, of which she identified as chocolate brown. What a wonder!!! Hooray! We are in Utah! Amelia and I pulled out at 3:45 this morning from Sidney and arrived at Park City around 11:20 am. Amelia was really good. She slept until 7:00 am then enjoyed watching the new movies I got her for the trip. 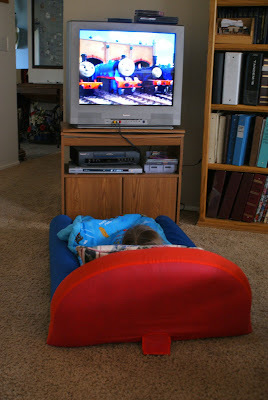 Amelia now loves Thomas the Train due to her close proximity to trains. I am suffering from post-long-drive-over-munchies! Staying alert was hard, so eating was the only thing that kept me awake. Constant eating like that makes me feel gross. At Park City I dropped some serious cash at Motherhood getting two cute dresses, some shirts, shorts, etc to get me through the summer. Tomorrow I need to exchange a couple things at the local store here, but mostly am satisfied with my purchases. The snow started coming down while we shopped. Parley's Canyon was slick but safe if you drove slowly. We stopped at Ken and Charity's house first to see Aunt Melissa, Ethan, and Grant before they left for a visit to Virginia. It was fun to see the cousins play together. I love all the little words Amelia says. She would mimic Grant when he cried with a hilarious fake cry. My little mime!! After that we played with Miekka, Seth, Jacob, and Lia. The cousins were REALLY LOUD. Poor Miekka had a headache after all the chaos...me? Just at the numb stage, aware I've been up way too long. I need to get used to the sleep deprivation with a newborn on the way. Miekka had a tent set up in the front room much to the kid's amusement. We had a super delicious dinner of cereal! It was the only food that sounded good to me. Now we are at Grandma Debbie's house for the night. I decided to stay here a couple nights until John, Courtenay, and Dad get here. Jana, Jeff, and De-bo are enjoying Amelia's chattering, smiles, and laughs filling Grandma's house. Hope the LION sleeps tonight! Here is a shout out to Daddy: WE MISS YOU!!!! *her favorite shape is an....OCTAGON. One day we were out walking and she shouts, "MOM isa OCTAGON!" I about dropped my teeth. Not sure where she learned octagon!! *she thinks she is "pretty as a pizza." Her toy camera says "You're a pretty as a princess" when the button is depressed, she has her own interpretation! *three nights ago I put her to bed. She wanted some chacholit milk...I gave her some chocolate milk. For some reason she didn't finish but forgot about the milk....until it was after midnight. I walk into her room finally understanding the screams for "chacholit" over and over. I made her some milk and 30 seconds and two sips later she was out like a light. She must've had a chocolate dream! What a funny kid. *running around in her mousie shoes! Watch video here! *her new favorite song is "Step in Time" by Mary Poppins. We watched it on the TV and she was absolutely delighted. Watch the video here for further entertainment!!! I must have my pregnant brain plugged in, wait, I do!!! 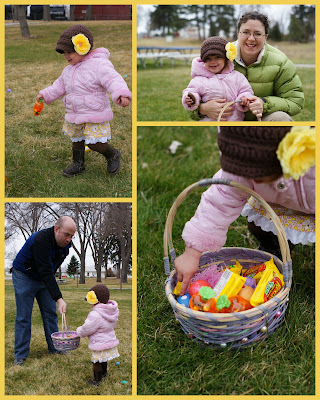 The community hosted a fun Easter Egg Hunt this morning at 10 am. All week I looked forward to participating in it. For some reason this morning I thought the hunt was at 10:30. We showed up 5 minutes early only to find the place deserted. After 10 minutes we stopped someone who said it started at 10 and ended about 20 minutes later. Huge bummer. Justin laughed...I didn't. 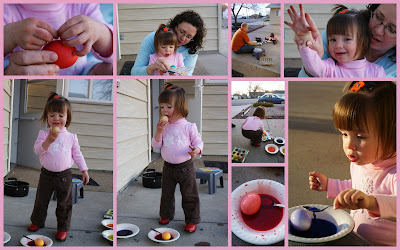 We drove home and picked up the eggs we colored yesterday and some Easter candy to hide around the park for Amelia. She did not really catch on to all the excitement. The sight of the slide and swings had more sway in her book. 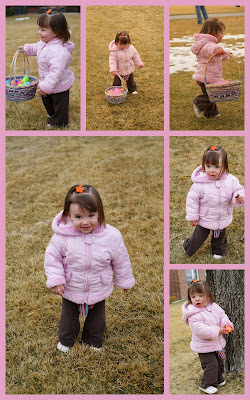 We tried to show her what to do but the prospect of plopping eggs into a basket was not appealing. It was freezing cold outside and really windy (huge surprise). Still I had to remove her coat for a picture (or 40) of her cute bunny outfit. I was bound and determined she'd wear it. 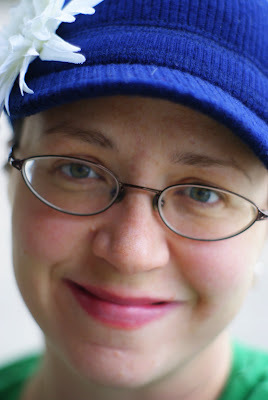 I also put one of the hats on going to the craft sale because it was so chunky and cute. Ten minutes later we were back home. Justin is helping the Webb's finish their basement this afternoon. The missionaries arrive on Wednesday! They are cutting it close. Amelia I took a short nap, like 30 minutes. Then we vacuumed the carpets and cleaned out my car. Cleaning the car was very amusing! I stretched it out as long as possible. Tomorrow I am planning on making mashed parsnips, buttered carrots, baked ham, and Challah bread. Yum, yum.